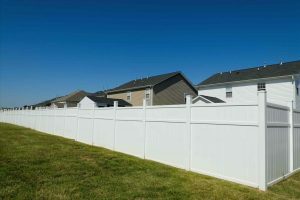 When constructing a wood privacy fence you have two options typically for the type of posts to be used: wood or steel. The type of fence post you choose will determine both how long your fence will stand up to the elements, and the overall cost of the fence. Be sure to compare the quality, longevity, and pricing of the various fence post types offered by your local fencing contractor. In general the cost of your post will be relatively small in comparison to the total cost of the fence once installed. However, wood post are usually the most cost-effective but that doesn’t always hold true depending upon where you live. 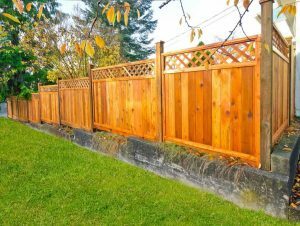 Wood posts are often the most popular choice for homeowners who choose to build their privacy fence from Cedar. The post themselves are usually also made of cedar or can sometimes be made from pressure treated pine. Most commonly, contractors use 4 x 4 or 6 x 6 inch Lumber for strength and durability. Cedar is a naturally rot resistant and makes a beautiful finished product when building wooden fences. But even Cedar Post can become soft and decayed when in constant contact with moisture from the ground. In some states the use of Cedar Post can be cost-prohibitive due to shipping expenses. Other treated post types consists of pine Hemlock or fir that are soaked with chemicals to help them last longer in a moist environment. Cost-wise this is the most economical choice at the beginning. These chemicals are often copper-based because copper has antimicrobial properties and are known to be toxic to living things. This is a deal-breaker for many homeowners who are concerned with pets chewing on the fencing. There is also concern that these chemicals could possibly leach into the soil or surrounding water sources. Due to the high level of wind resistance created by a privacy fence, it is recommended by most fence professionals that the hole diameter be three times the diameter of the post. This means that a 4 x 4 post requires a 12-inch diameter hole that is 36 in deep to get below the frost line. Steel fence posts will actually cost you more than wooden posts. The extra cost can be offset by the fact that it usually won’t rot or decay, depending upon the type and brand that you buy. And, steel posts require a smaller diameter hole to be dug and will use a little less concrete. However, they also must be buried below the frost line. Galvanized steel fence posts are designed to resist corrosion and last a lifetime. You can get them in three basic shapes. Round galvanized posts that require brackets and a cap, square steel tubing with flanges, and conventional steel posts for farm use. Unlike a wooden post the steel post will resist twisting and warping. The only major drawback to using steel instead of wood is the fact that steel post usually don’t look as nice. 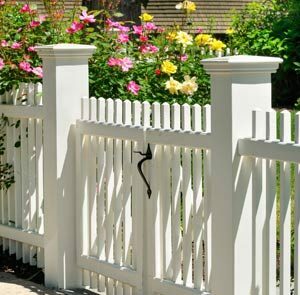 However, some manufacturers do make metal post that can be covered and made to look like a seamless wood fence. If you opt for this type of fence post you get an attractive look of wood mixed with all the great benefits of a galvanized steel that’s designed to endure. Call Fence FAST today for your fence quote!